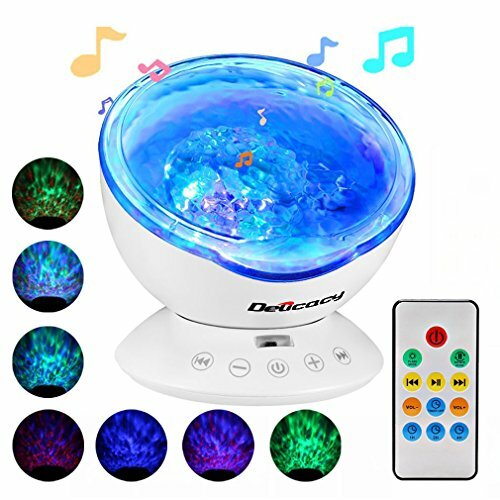 Delicacy ocean wave night light projector and music player.You can enjoy the tranquility or relax after a day's work by using this ocean wave projector with a mini speaker. There are 7 various light modes: multicolor lighting, multicolor cycled lighting, multicolor quick flashing, solid red, solid blue, solid green, etc. Create a romantic or peaceful atmosphere for your entertainment or leisure. Long press the middle key to turn on or turn off. Shortly press to switch light modes. Easy to control the volume and hypnosis music with the sensitive keys on the projector. Moreover, you can freely control the projector by the provided remote controller, which is powered by 2 AAA batteries (not included). Save your efforts! The ocean wave night light projector has built-in speaker so you can insert TF card to play music or connect it to your iPod, MP3, laptop, cellphone and so on via the included 3.5mm audio cable. Enjoy your preferred music in the pleasant atmosphere. Built-in hypnosis music to choose from: ocean wave sounds, flowing water bird sounds, forest insect sounds, merry nature sounds. Further, the motor works with minimal noise without disturbing you. Bring you a calming surrounding to relax and fall asleep easily. Our ocean wave projector light can be flexibly adjusted to the suitable angle for casting light. ✔【 Remote Control & Touch Senor】: The Delicacy latest ocean wave night light projector with remote controller and touch senor keys,freely turn on/off the lamp, change lighting mode, adjust the volume, to set automatically turn off timer. ✔【 12 LED & 7 Color Changing Mode】: Multicolor ocean wave projector night light lamp with 7 kinds of color model changing,choose which mode show depending on your mood , show you a watery ocean atmosphere,bring the seaside home to you! ✔【 45 Degree Display Angle Adjustable】: The projector can be based on your needs 0-45 degrees tilt, along the different directions upright or projection. Perfect for any festive party decorations for children to create a pleasant and relaxing bedtime experience, soothing and comfortable children to sleep. ✔【 TF Card Readable】: Built-in Mini Speaker and plays your favorite song while light show, and the audio input can be connected to mp3 player, ipod,iphone,ipad,android phone,tablet pc and PC for music playing.enjoy romantic, relaxation, cozy atmosphere music. ✔【 Auto Off Timer】: 3 Auto off timer options (built-in 1H, 2H, 4H auto off timer) the lamp will automatically shut off after the preset time. And of course timer can be cancelled to stay on all night long. You can access these settings and options without getting out of your bed. If you have any questions about this product by Delicacy, contact us by completing and submitting the form below. If you are looking for a specif part number, please include it with your message.